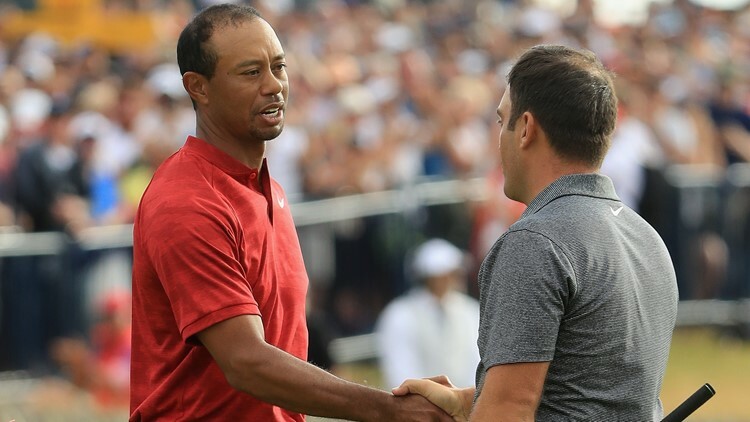 Francesco Molinari has won the British Open capping a thrilling Sunday that saw Tiger Woods get himself in the hunt. Molinari's 2-under-par 69 earned him his first major championship. Molinari, 35, won his first PGA Tour title earlier this month at the Quicken Loans National. He finished at 8 under for 72 holes with a bogey-free round to win the Claret Jug by two shots. Four players tied for second at 6 under, including American Xander Schauffele, who played in the final group with Jordan Spieth. Justin Rose, Rory McIlroy and Kevin Kisner were also 6 under. Woods shot 71 and finished 5 under to tie for sixth. Despite a spectacular surge, Woods' run at the trophy and his 15th major championship was spoiled by a double bogey on No. 11 and bogey on 12. He held the outright lead after Spieth bogeyed No. 5 and Schauffele carded two bogeys and a double. Woods shot a 5-under-par 66 in Saturday's third round that left him at 5 under through 54 holes and four shots back of the leaders. His 66 was his first weekend round in the 60s in the Open since 2007.